Even in a neighborhood of grand and spectacular homes, 108 8th Avenue is a standout. 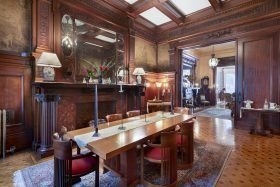 The Park Slope townhouse has the scale and level of stunning historic detail that is, as the listing boasts, rarely found in a private home. It is also quietly possessed of 21st-century luxuries like central air and meticulously tended outdoor spaces, making it an even rarer gem that’s now on the market for the first time in decades, asking $$8.8 million. Built in 1900, this limestone-clad mansion has a wealth of historic details like filigreed mahogany woodwork, original wood floors, delicately carved mantels and stained glass from world-renowned artists. Martin Scorcese’s “The Age of Innocence” and HBO’s “Boardwalk Empire” have made use of this opulent home to capture the essence of gracious living from a bygone era. 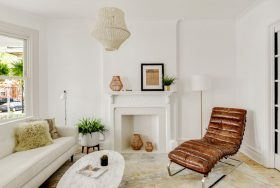 With a pale Scandinavian vibe and sunlight around every corner, this modestly-sized single-family home at 268 East 9th Street in Kensington has been thoughtfully renovated for modern life. Three exposures, a skylight, a quaint–and rare–front porch and a large fenced backyard add to the country-in-the-city feeling. 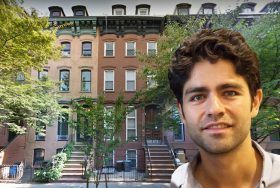 In 2015, 6sqft reported that “Entourage” star, filmmaker and local green renovator had just purchased an impressive five story home in the heart of the Clinton Hill historic district. 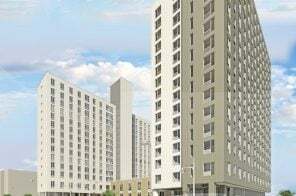 Nosy neighbors and friendly observers have noted steady progress in the massive renovation effort that has followed at 112 Gates Avenue. Now the New York Post tells us that the home, which the actor adorably bought for his Brown Harris Stevens broker mom, will not only retain its Landmarks-mandated charm but will be positively flush with modern conveniences–starting with $10,200 Toto Neorest 750H high tech toilets courtesy of a sponsorship by the Japanese manufacturer. “Million Dollar Listing New York” star Ryan Serhant had recently taken over the listing for novelist Jonathan Safran Foer’s gorgeous five-story Boerum Hill home, asking $8.995 million; the award-winning scribe first listed the home with Compass for $10.5 million last May. Now, according to The Real Deal, Serhant is the new owner of the 8,000-square-foot townhouse. Safran Foer bought the 1899 Greek Revival home at 374 Pacific Street for $5.4 million in 2014, so while the sale price represents a price chop, he didn’t do too badly on the deal. Daniel Craig image via Flickr. 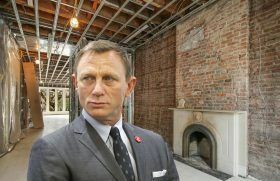 Actor Daniel Craig is the latest of the Hollywood brigade to land in Brooklyn, according to the New York Post. 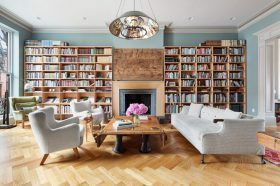 The 21st century James Bond and wife Rachel Weisz have reportedly scooped up the Cobble Hill townhouse at 22 Strong Place formerly owned by author Martin Amis. 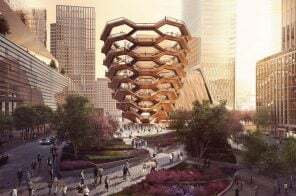 The home was damaged in a fire in 2016; Amis and wife Isabel Fonseca, who’ve moved to a Downtown Brooklyn apartment, offered the property complete with intact (despite the blaze) recent renovations and landmarks-approved plans for repairs as per the listing. The Oscar-winning actress and her husband, Paul Bettany, bought the detail-laden limestone mansion overlooking Prospect Park in 2003 for $3.7 million; the 6,500-square-foot townhouse changed hands two more times since then: the couple sold it for $8.5 million to a Google exec who divested of it in 2015 for $12.4 million (a neighborhood record a the time). It’s on the market once again asking $14.5 million. 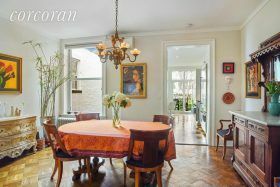 Filled with historic detail and dressed to the nines, the elegant home is exactly what you’d expect to find behind the elegant facade of a Park Slope limestone. Built in 1899 and designed by renowned architect Montrose W. Morris, the 25-foot-wide five-story home at 17 Prospect Park West is a showcase of stained glass windows, mahogany columns and herringbone floors, with five working gas fireplaces, a 600-bottle wine cellar and a verdant gated yard. This Brooklyn townhouse is unique in that it comes with a south-facing front porch. It’s large enough to place some chairs and a small table and looks down over the front garden. And out back, there’s a charming backyard with custom wood fencing and lighting, specially designed by a landscape architect to bloom flowers from spring into fall. All this excellent outdoor space–just as the weather starts to heat up–comes from the Windsor Terrace home at 225 Windsor Place. The interior isn’t bad either, as it boasts a modern, renovated kitchen alongside some restored historic details. After last selling in 2008 for $1.497 million, the home is now asking $2.25 million. 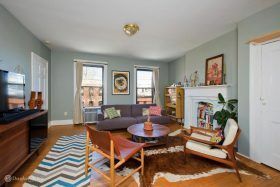 This Park Slope duplex is located just one block from Prospect Park and Grand Army Plaza, and chock full of prewar details inside. 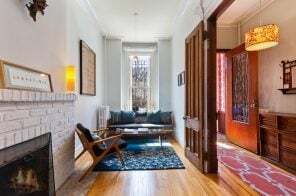 Taking up two floors of a historic brownstone at 85 8th Avenue, the rooms are lined with detailed stained glass, the original moldings, hardwood floors with an incredible walnut inlay, and painted brick walls. In the wintertime there’s a working fireplace, and for the summer there’s a private deck. 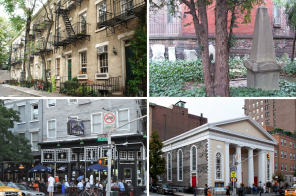 For such a dreamy Park Slope offering, something that’s sure to make old house lovers swoon, it’ll cost $1.095 million. This three-family brick townhouse comes from Brooklyn’s waterfront neighborhood of Red Hook. 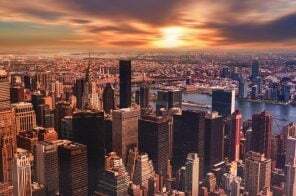 The area is known for its striking views of the Lower Manhattan skyline, and the listing promises those same views from the top floor of this home, located at 371 Van Brunt Street. Add in tin ceilings and fireplaces throughout the lower levels, and the historic property, now on the market for $2.5M, is sure to charm. 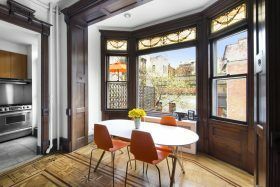 This may be a traditional Brooklyn brownstone on the outside, but the duplex rental occupying its parlor and garden floors looks as modern as it gets. The home, located at 284 Warren Street in Cobble Hill, underwent a gut renovation in 2007 and has been occupied by the same owner ever since. 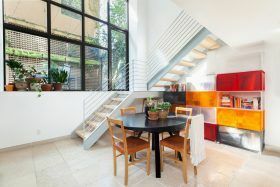 They’re now renting out the bottom two floors for $8,500 a month, and any new renter is going to like one thing in particular, especially with summer coming up–a double-height wall of glass that frames the private, stone-paved backyard.